There are a lot of death stories out west, up and down the coast, in the sea and inland we are hearing tales of animal deaths. The amount of accumulated pollution, on both land and sea, is astronomical, with a heavy lacing of heavy metals—mercury, a severe neurological poison—is everywhere interfering with biological life. However, since Fukushima a bad situation has gotten significantly worse. 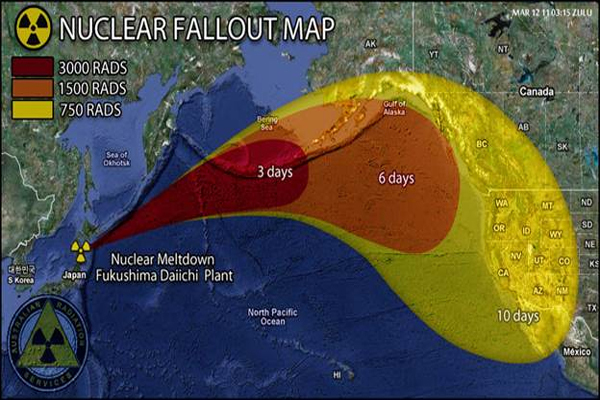 We know that the northern Pacific Ocean is now polluted with radiation from Fukushima. Now they propose for even more dumping of radiation into the sea. There is no solution there it is just dump it into the sea and let other people, at another time and place, suffer the consequence. In Japan thyroid cancer continues to show up. The most recent news from Fukushima: It has released 13,000,000,000 times more neutrons than initially estimated — “Obvious implication for human health” — Gov’t: “Neutron radiation is the most severe and dangerous radiation” known to mankind; Can travel great distances.” Has any government stepped up to the plate to warn its people about the increasing radiation dangers so they can do something to protect their children? Everyone knows the answer to this! “Neutrons are the bad boys of the radiation story, and are only found as a consequence of a nuclear reaction (controlled or uncontrolled). Their penetrating power is extraordinary, requiring several meters of solid substance to stop them. They work their harm by indirect ionization, which is not unlike a pool ball smashing into a lamp. A typical example would be the capture of a neutron by a hydrogen nucleus consisting of a single proton, which is then ripped away from its position by the kinetic energy contained by the neutron, and then, like our billiard ball, careens about breaking things, ionizing some atoms/molecules, or shattering the bonds between atoms. In terms of biological damage, neutrons are horrific – roughly ten times more damaging than beta or gamma radiation on a per-unit-of-energy basis,” writes Chris Martenson. Early on, we read about neutron beams. Much damage has already been done. “This is very amazing to me, having been working in the radioactive xenon monitoring field for about 17 years now. This was astounding to me… You can see background levels around 0.1 mBq/m3… Note the peak concentration we saw was in the range of 45,000 mBq/m3 — so that is 450,000 times our background level. For me that’s astounding. We never have ever seen anything even close to that. So the concentrations went up and up and up every day, and so that was quite amazing to see this 7,000 kilometers away from the event… I only show some of the data here, but it actually persisted for weeks at very measurable levels, and filled the entire northern hemisphere and mixed into the southern hemisphere.” Reports one of the researchers and posted on ENE news. One form of radioactive Iodine lasts for 16 million years. It decays into radioactive Xenon 129 sometime during these 16 million years. Xenon 129 gas causes lung cancer. This Xenon 129 then decays into radioactive Cesium, which also causes different kinds of cancers and heart problems, while destroying the immune system, among other things. Some types of radioactive xenon is produced from nuclear fission. Other isotopes of xenon are produced by beta decay meaning heightened world levels of xenon are a symptom of numerous other types of radioactive particles decaying in the broad environment. 131mXe, 133Xe, 133mXe, and 135Xe e some of the fission products of both 235U and 239Pu. This is a small piece of uranium mineral sitting in a cloud chamber that shows us the process of decay and radiation emission. It offers a look at the death principle that radiation is, especially if any radioactive particle gets inside our bodies. One atomic particle, absorbed into the body, especially plutonium, can do a person in. Science and medicine have been corrupted with the ‘radiation is safe’ paradigm. In truth all increases in radiation lead to increasing incidences of cancer. The reactors at Fukushima did not just suffer a meltdown, or even a China syndrome type melt-through, but a series of melt outs. Scientists have no idea where the cores of the nuclear reactors are and even if they did, there would be little to nothing they could do about it. The chief of the Fukushima nuclear power station has admitted that the technology needed to decommission three melted-down reactors does not exist, and he has no idea how it will be developed. In a stark reminder of the challenge facing the Japanese authorities, Akira Ono conceded that the stated goal of decommissioning the plant by 2051 may be impossible without a giant technological leap. For the rest of our lives and our children’s and their children’s lives and possibly forever, humanity has a festering nuclear sore on the surface of our planet. In response to the Fukushima crisis all governments have declared Fukushima and radiation itself to be a non-problem that we do not need to lose sleep over. However, Japan has banned journalist coverage, and Japan has once again slid into fascism. The United States is not far behind. The truth is ugly so it need not be told by those who want to remain popular.